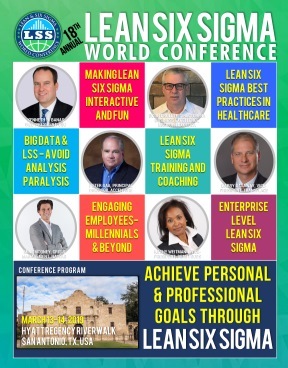 Lean Six Sigma World Conference - Anthony, Stephen G.
Steve is a leading UK Six Sigma Master Black Belt, helping solve complex problems in complex organisations – from public sector to medical products. He provides bespoke in-house consultancy and management development at all levels, as well as mentoring for Black Belts, and problem solving on challenging issues. He is the CEO of The Institute of Six Sigma Professionals, is setting quality standards for Six Sigma in the UK and also developing new Six Sigma methods to address complex issues, including non-normal control charts, and reverse DOE. As well as being a leading UK Six Sigma specialist, Steve is also a qualified business advisor (Sfedi and ILM) and management systems assessor (EFQM, ISO9001:2008, IiP) This enables him to support organisations in all aspects of their improvement journey, by integrating change and embedding results at all levels of a business. With a leadership diploma from Harvard University, an MBA and a Masters in Engineering, as well as over 20 years industrial experience, Steve has enviable academic rigour in his approach, blended with down to earth practicality and humour. Stephen is currently studying part time a Phd at Herriot University, linking leadership in the public sector to successful Lean Six Sigma implementation.